I’ve started this post umpteen times and aborted it. I run out of steam. I get distracted. There is something to be done or someone that needs my attention, I was ill a few days and then at other times, I have had to be somewhere – there is a time-sensitivity to everything. It’s eight and a half weeks since my brother in law died. This is the filter and the lens through which Christmas has come this time, with all of its contradictions. Christmas itself makes things take on a strange heightened reality. The more it cranks up, the more energy it seems to take to hold it at bay and to filter anything that has meaning and give the push back to everything else. It makes me feel like a Grinch, not to join the exuberance, but that’s not what it is about for me – I just want to filter it to the handful of things that matter the most and hold that as being enough for now. So here it is. I walked Cavehill one morning recently – before the winter solstice. I was early enough to be leaving the car park at 7.20 am, so the first of the morning birds were calling to each other and so that far below the rumble of this troubled, restless, begrudging city could sparkle for a bit and rise above its own petty squabbles of flags and Haass talks and miserly politicians caught in the same-old-same-old. The darkness made a lattice of the trees, and the dawn light, grey and yellow at first, weak and half-hearted, warmed across the morning to colours of rose-pinks. The trees looked muscular. On a day like this, I knew to take the shepherd’s warning and recognized that the best of the day’s weather was at hand. 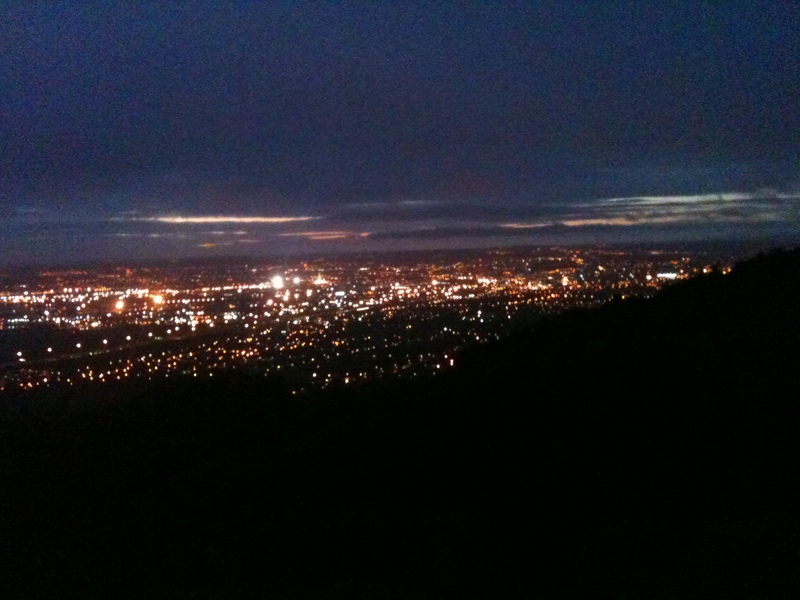 From Cavehill the city is snug and hunkered. In the morning light with the lights on, it sparkles. This is not an illusion. It’s a reality too – another view of the city; a new lens and something is added. Far off somewhere, perhaps Ligoneil, an Orangemen’s band warmed up and warbled. The sounds drifted up, distorted on the wind. The weather was hasty that morning. It was still at first, and then later the clouds raced over the sky – thin wisps, far up and moving in the fashion of film in time-lapse. Fog and mist came and went, as though the weather front itself was billowed into fast-forward. I was grateful to have the health to do it and grateful to have the volition to leave my cosy bed and just go. I was grateful not to be alone and grateful for all there was to see and hear and for the thrum of muscles put to work, walking the hill-side. I was glad to be in the air, and glad of the cold, noticing how much more comfortable it is to walk heat into the body than to battle the heat of a summer day. How good it felt to have soft rain on my face. Nothing changes the fact that we have lost someone we knew and loved. Nothing changes the absence of him and how absolute that is, but we know him by the impact he has had on us and it moves us differently. 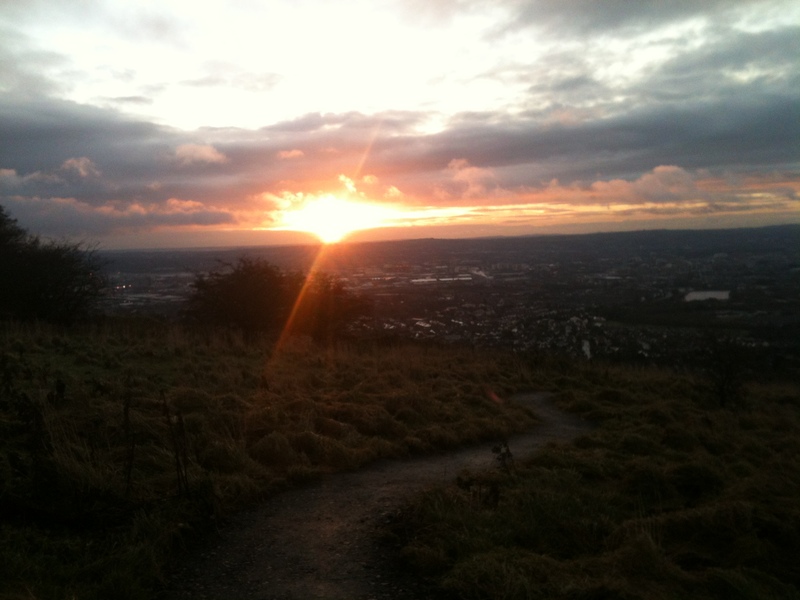 Risk this sometime – leave your cosy bed on a winter morning, before dawn and walk the Cavehill. This entry was posted in Uncategorized and tagged absence, Belfast, Cavehill, Christmas, dawn, death, Haass, Ligoneil, Literature, loss, Maria McManus, Orange Band, politicians, Winter Solstice, writing. Bookmark the permalink. Great piece of advice: inspiring really. Nothing quite so healing and calming as early morning walking. Thanks for the beautiful descriptions.